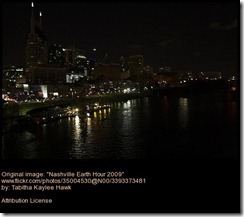 Suppose you’re writing about Earth Hour (this year it’s 8:30 – 9:30 pm on Saturday, March 27th). You want a picture that attracts the eye and helps your readers to see at a glance what your blog post is about — stars? candles? a city skyline before the lights go out? — but you don’t have the time or opportunity to go take a photograph. No problem. Stock photo sites often have great deals on low-cost images for your blog or website... but what if your budget is a big fat zero? Again, no problem. Next week we’ll be running down some good sources for free or public domain images you can legally use on your blog or website. But for now let’s focus on the number one source of free photos online, Flickr.com. Flickr has evolved from an online photo storage site to more of a social network, an online community of shared interests — not always based around photography, but around the subjects of images posted there as well. Some of the photographs are private — shared only with friends and family — while others are on public view and open to comments. Best of all, for our purposes, there are a great many user-contributed photographs on Flickr that have been licensed by their creators under CreativeCommons.org terms for free use by others. Now, there are several different Creative Commons licenses, depending on what uses are allowed and on what terms — various combinations of the elements Attribution, NonCommercial, ShareAlike, and NoDerivatives — so do read the fine print carefully before you grab a photo to use on your site to make sure you’re in line. At the very least, the most open of CC licensing terms will require you to give attribution for the work — and the courteous blogger will usually add a link back to the person who created or licensed the image, even if it’s not required. What a small "price" to pay for access to an unbelievable number of photos from around the world, on any topic you can imagine! You can browse for CC-licensed photographs on Flickr at http://www.flickr.com/creativecommons; or you can specify “Only search within Creative Commons-licensed content” in Flickr’s Advanced Search; or you can go at it the other way round, starting at http://search.creativecommons.org/ and selecting for Flickr content only. Quite often, however, I tend to go straight to Blue Mountains’ FlickrCC — a free online Flickr search tool that filters by keyword and licensed use, shows the search results as thumbnail images with a one-click preview pane, and lets you save your selected photo or edit it online. Visit http://flickrcc.bluemountains.net and tick off the appropriate checkboxes, over at the top right, to restrict your search to images you can edit and/or use for commercial purposes, if needed. Enter a search keyword, and you’ll be presented with an array of appropriately licensed Flickr photos as a mosaic of thumbnail images on the left. Just click on any thumbnail to see a larger version in the preview pane on the right. Now, there are a few different ways to go from here, depending on how you prefer to get the image and what you’d like to do with it, in terms of editing. You can always simply right click and save the image you see in your browser, making a note of the attribution info provided, and go from there as you would with any other photograph you might want to post on your blog. Or you can click through to the photo page on Flickr.com and get the image there, following the on-site instructions. Or FlickrCC’s got an “in-house” editing tool that automatically adds the required attribution as a caption (no link) on the photograph you’ve selected. You’ll get a few options to choose from — text, colors, frames, and so on — and you can preview the results of each choice before you commit to it, and go back, undo, and make new style choices until you find a look that you’re happy with. 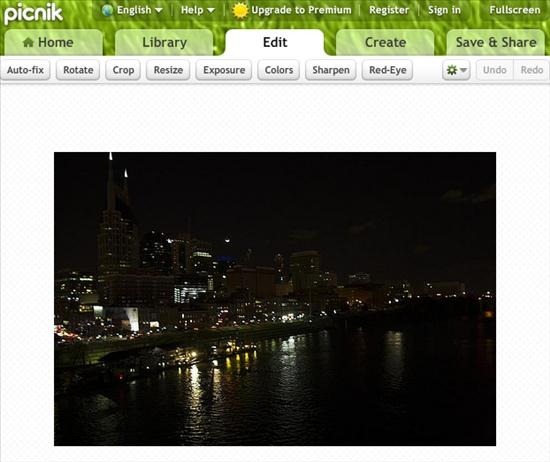 Alternatively, you can send the image over to Picnik, one of the easy-to-use free online image editors we looked at yesterday, where you can crop, resize, or otherwise get the photograph ready to post on your blog or website. Look just below the FlickrCC preview pane, and you’ll see there’s a line of links to different image shapes and sizes: Square, Thumbnail, Small (the preview size), Medium, Large, and Original…When you click on any of those links, you’ll get a pop-up preview of your chosen image (with proper attribution noted right below it) and an “edit this image” link that goes right to Picnik.com, opening up the photograph. Edit, save, and you’re ready to post to your blog in the usual way — adding the required attribution, of course! 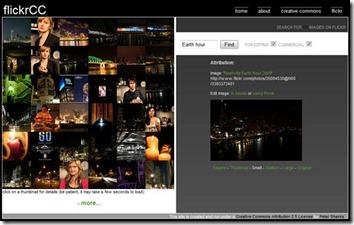 Other ways to find Creative Commons-licensed content on Flickr? Well, I’m aware of Compfight and FlickrStorm, although I haven’t used either of them very much yet, and also PhotoDropper, a plugin for self-hosted Wordpress blogs that automates the search-and-post process… but is that OpenOffice.org plugin still around, the one that helped you drop a CC-licensed Flickr image into a document? 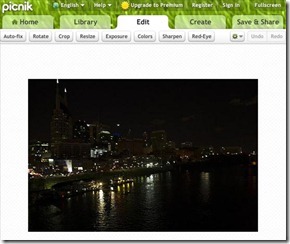 What other Flickr search tools are you using to find CC-licensed images? I use Compfight mostly as it loads dozens of photo thumbnails on a single page really quickly, enabling you to choose a good pic without much fuss. However, I like the sound of FlickrCC and will be checking it out. Another way would go to the Yahoo or Google search pages - the Advanced Search page now includes an Creative commons search option as well. Great post: I love your succint, to-the-point posts. A must-read for me, always. Thanks for these tips! I was just wondering about this today and voila, the solution appears! @Sharon, thanks for the firsthand feedback on Compfight - I like the thumbnail display in FlickrCC, so will certainly take a close look at Compfight too. @Dalit, thank you! Search engines have really come a long way with Advanced search features, for sure: it may be time to revisit that topic. I almost exclusively use Compfight (http://compfight.com/). The images are beautiful and artistic. It's easy to just - just tick the "creative commons only" box and the program goes to work searching Flickr Creative Commons for you. The only catch is to check the specifics of the CC license on the Flickr image once you've selected the image that you want to publish. @Debra do have a look at FlickrCC, too - it searches only Creative Commons by default and the tick boxes narrow down the search to images you can edit and/or use for commercial purposes. Compfight certainly has better thumbnails but that particular feature of FlickrCC can be a real timesaver when you're in a rush. Wouldn't it be great to have a search tool that blended the best features of the two? I absolutely LOVE Compfight! It's the best tool I've found. I like that it loads so many images per page, at a size where I can see scan across them quickly to see if they will work. I do a lot of PowerPoint design and I rely mostly on CC photos for my backgrounds and compfight is the best way I have found to find them quickly. I also like that you can switch between searching "tags" or "text". If I can't find the image I need one way, search the other way often turns something up (http://compfight.com/). Additionally, unlike some other flickr search engines, it's one click to open the image, so I can use my click wheel to open 20 or so in new tabs as I scan down the page, and then see the larger version to know if they will actually work. Thank you for this post, it is just the information that I need. I just started my blog and it's a plain Jane site. Now I need to figure out which images to associate with my blog posts, and that will improve with time. Thanks for helping me to improve. This helped me out a lot. I was looking for University of Alabama logos to use for my blog and wasn't able to find any.. also I didn't see or know the rules were posted anywhere about how to use licensed things. Thanks for all the info.. now I know. William and Sarah, thanks - so glad you found it helpful!